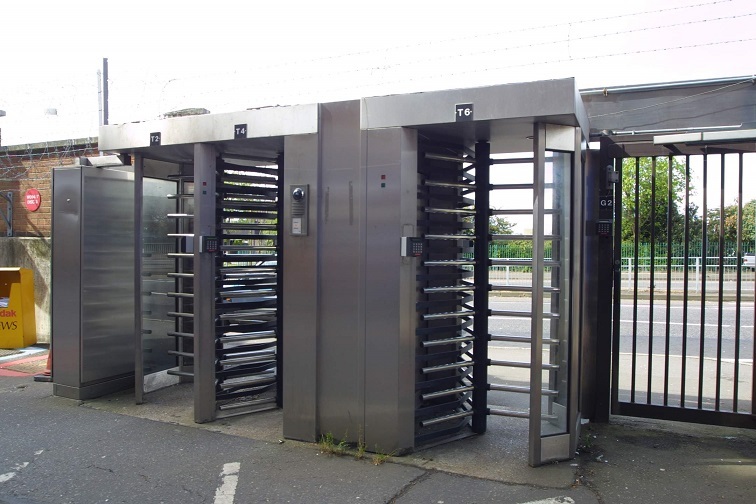 For applications where crowd control is the security goal, tripod turnstiles have proven to be the ideal solution, as they effectively direct users through specific, guarded entry points. Entertainment venues, transit stations, and public buildings, among many types of applications, choose tripod turnstiles for their ability to withstand a large volume of users in abusive conditions. There are a wide variety of access control options to suit individual requirements. Push button, card reader, keypad and biometric readers can be fitted with minimal electrical work or can be integrated with your existing security systems. Your first line of defense occurs at the building perimeter. Full height turnstiles are a rugged, low-maintenance solution for the harshest outdoor conditions, acting as a deterrent against tailgating and unauthorized entry at your fence line. Building interiors can also benefit, and we offer transparent full height turnstiles designed for this purpose. Indoors or outdoors, expect a full height turnstile to deliver decades of trouble-free operation. We deal with all brands of Turnstiles Secureye Turnstiles in Hyderabad , ESSL Turnstiles in Hyderabad , Magnetic Auto Control Turnstiles in Hyderabad , FAAC Turnstiles ,CAME Turnstiles in Hyderabad.